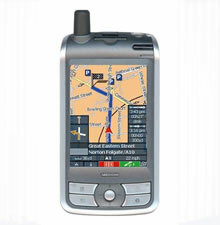 The Medion 100 GPS in-car Sat Nav Pocket PC. Still available from some retailers, and lots second hand. Is it any good, and is it worth buying? The Pocket PC side of things is fairly basic compared to modern offerings. 256mb SD card, 65k screen, IR port, but no wireless or Bluetooth. It does have a built-in GPS receiver, which makes it great for in car use, and also for the pedestrian. I'm a big fan of Pocket PCs, and this one has all the applications that I use, Calendar, Tasks, Pocket Word, Excel & Reader. The unit itself is quite large, but it does feell chunky & solid, it should last well. The Medion 100 GPS xomes with everything you'll need. Docking cradle, USB lead, car & home power leads, windscreen bracket, bike bracket, case, & maps for Western Europe. Like many GPS devices of its generation the Software takes a bit of getting used to, it only has 5 digit Post-Code look-up, but has plenty of Points of Interest, and it never let me down on the many long trips I used it for. The software is no where near as user-friendly as Tomtom or Navman, but remember, if you can pick one up for a bargain price, it would be well worth loading up Tom Toms Navigator software & using that instead, which is what I would probably do.